Whether you are a new salesperson, or a very experienced salesperson, selling houses, insurance, advertisements or ideas—or anything else—this book is for you. 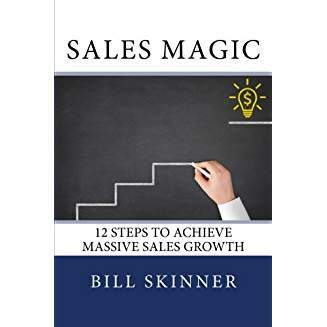 Sales Magic: 12 Steps to Achieve Massive Sales Growth introduces readers to a 12-step process that works like magic in dramatically increasing salespeople’s conversion rates— without depending on costly advertising or aggressive messaging. Bill Skinner, a senior business executive and co-founder of Paramount Business Development, Inc., who has led businesses to double digit sales increases, shares instructive narrations and step-by-step guidelines on how to become a confident, winning salesperson. You will learn how to ask for the sale and discover ways to successfully beat out your competition. No matter what you sell, you will be more efficient and profitable—and more valuable to your company.